Malony is around six years old, intelligent, calm and self-controlled in front of judge Blaque, when his mother, Séverine Ferrandot (Sara Forestier) in tears tries to explain how uncontrollable her son is. As you watch it, the camera continuously follows the still six-years-old Malony whose calculated looks allow you to predict his approximate future. The future that comes quickly where he’s again in the room of the judge and once again unhappy about everything around him. There is something special about Malony, despite his most of the time disgusting attitude that will make you wish to punch his nose every time. As the story progresses, you get a chance to know about his past more, especially the time when he was abandoned by his own mother. That of course allows Malony to get extra points to earn your sympathy. However, it’s the juvenile judge Blaque and Yann who see something unique about him that makes them to invest as much time as possible to ensure that Malony one day will be a person they want him to become. In conclusion, “Standing Tall” is an intense drama about a man who had to survive a difficult childhood. Rod Paradot as Malony is truly remarkable as he captures all hate, desperation, aggressiveness and violent behavior the young man had. Moreover, it’s an extremely emotional story that will warm your heart. As usual, there is no question about Catherine Deneuve’s performance, but it would be fair to mention that everyone in this film does a tremendous job to ensure that Emmanuelle Bercot’s effort won’t be wasted. And it was not! 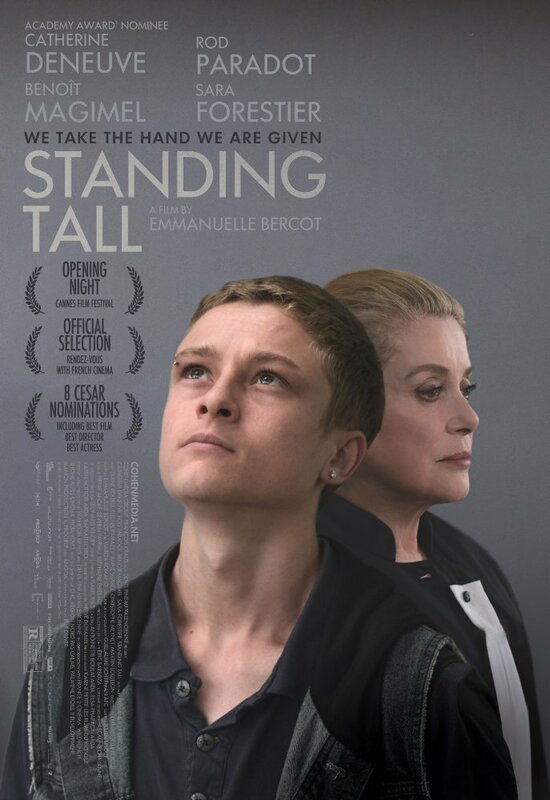 So, if you are looking for a meaningful film to watch, “Standing Tall” is the right film for you, as it has an important message in it you would not like to miss.